With Tim Laird, America's C.E.O. 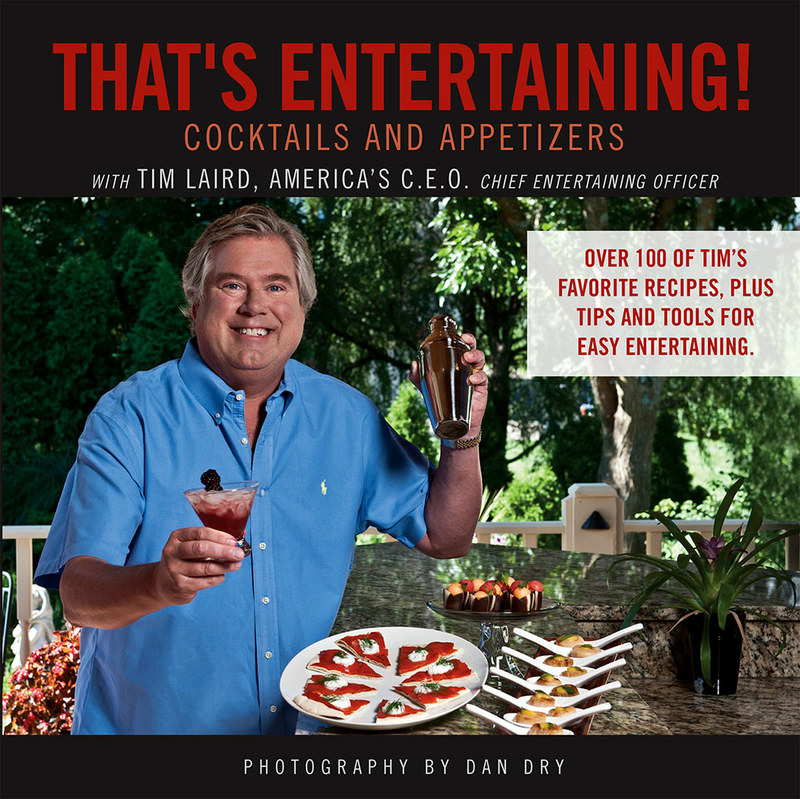 When Tim Laird travels across the country and around the globe teaching classes and seminars on entertaining, he is often asked, "Do you have a book of good cocktail recipes?" Well, here it is — Tim's hand-picked collection of some of his favorite cocktail recipes, coupled with delicious appetizers that are easy to prepare, but can make any host look like a pro. THAT'S ENTERTAINING! COCKTAILS and APPETIZERS, with Tim Laird, America's CEO (Chief Entertaining Officer) is an easy-to-follow guide for party planners, featuring over 100 show-stopping but simple-to-make recipes. Hosting a party means getting together with family and friends to have fun. Tim believes hosts should be able to have fun at their own parties and, as he often says, "entertaining should never be intimidating." This book helps relieve the stress of what to prepare and how to prepare it. Tim guides readers through each spirit category with interesting anecdotes and stories. He shares history and imaginative recipes for all of the traditional spirits, and includes chapters on lower-calorie Skinny Cocktails, Wine Cocktails, Dessert Cocktails, and alcohol-free Mocktails. Sprinkled throughout each chapter are some of Tim's favorite recipes for appetizers that pair well with certain cocktails but can also be served with others. Every recipe in the book is accompanied by an image of the prepared dish or cocktail, brilliantly photographed by Dan Dry, one of America's most widely acclaimed photographers. Whether you are hosting four friends for cocktails or a casual get-together for forty, you will find cocktail and appetizer recipes that work well for both occasions and everything in-between. Tim believes every host should have the confidence to entertain at home. By learning how to craft simple spirits into creative cocktails and how to pair them with easy-to-make appetizers you, too, can entertain like Tim Laird, America's Chief Entertaining Officer! THAT'S ENTERTAINING! 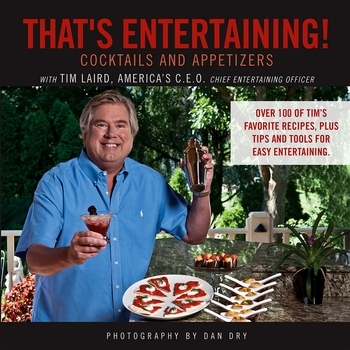 COCKTAILS and APPETIZERS is the second book featuring Tim Laird's personal recipes and tips for stress-free entertaining. His inaugural book, THAT'S ENTERTAINING!, contains over 300 pages of ideas for a variety of entertaining occasions throughout the year. Stay tuned for future books featuring more of Tim's simple secrets for easy but extraordinary entertaining. In That's Entertaining! Cocktails and Appetizers, Tim and Lori Laird have partnered with their good friend, photographer Dan Dry, to create a feast for the eyes as well as the palate. The Lairds and Dan collaborate regularly on features in Food & Dining magazine. Tim Laird — America's C.E.O. (Chief Entertaining Officer) — is an authority on wines and spirits with more than 20 years' experience in the hospitality industry. A connoisseur of fine wines, spirits, and champagnes, Tim is also a gourmet chef and a master at entertaining and execution. He makes hundreds of appearances a year on radio and television programs and has appeared on The Today Show, The CBS Early Show, The Tonight Show, ABC World News Now, and the CNBC and FOX networks. Tim also hosts two weekly television shows in his home-state of Kentucky — Secrets of Bluegrass Chefs and Secrets of Louisville Chefs Live. He is a featured columnist for Louisville's Food & Dining magazine and author of That's Entertaining! with Tim Laird, America's C.E.O. — Chief Entertaining Officer. In his role as the C.E.O. (Chief Entertaining Officer) of the Brown-Forman Corporation, a major producer of fine wines and spirits in Louisville, Kentucky, Tim enjoys teaching audiences around the world how to make entertaining fun and easy, and how to make delicious cocktails. Dan Dry currently holds the position of Chief Visual Officer and Senior Vice President at Power Creative, a Louisville, Kentucky-based advertising and public relations firm. One of America's most widely acclaimed photographers, Dan has won over 400 national and international photography, advertising and design awards during his career, and received his profession's highest honor, being named the National Newspaper Photographer of the Year by the National Press Photographer's Association. Dan interned at National Geographic, then traveled the world as a contract photographer for the magazine for an additional eight years. He was a member of the Courier-Journal's Pulitzer Prize-winning staff from 1976 until 1982. He is the sole author of over 23 coffee table books and has contributed photographs to over 100 additional books, including America 24/7 and A Day in the Life of America, the only book of photography ever to top the New York Times bestseller list.